Pomegranates, or rimonim in Hebrew, are one of the most recognizable and highly symbolic fruits in Jewish culture. Originating in Persia, these reddish, thick skinned fruit (technically a berry) begin to appear in markets at end of summer and are readily available for holiday cooking by Rosh Hashanah. In biblical times, pomegranates were used to add tart flavors to ancient dishes before lemons and tomatoes were discovered. Since then, pomegranates have been used to add unique and complex dimensions to Sephardic and central Asian soups, stews, sauces, chutneys and desserts. 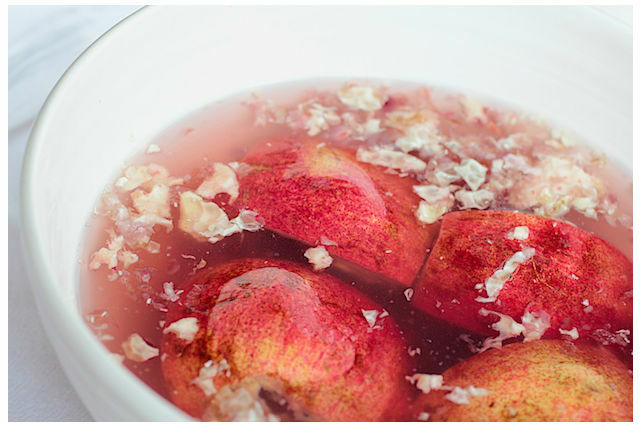 They may be juiced, dried, reduced, ground or pressed into pomegranate oil. Today, pomegranates are prized for their antioxidant and potent nutritional value, just as they were in ancient Egypt when the seeds were believed to heal intestinal disorders. Juice, molasses (actually a reduction and thickening of the juice and sometimes called pomegranate concentrate or syrup) and arils are used in a wide range of applications including cocktails, glazes, simmer sauces, and glistening toppings for green salads and vegetable dishes. 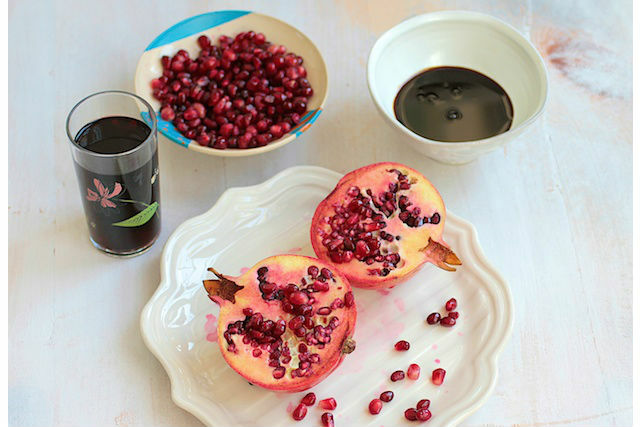 In The New Persian Kitchen, author Louisa Shafia offers numerous pomegranate dishes including a classic Iranian stew called fesenjan, often served at celebrations. 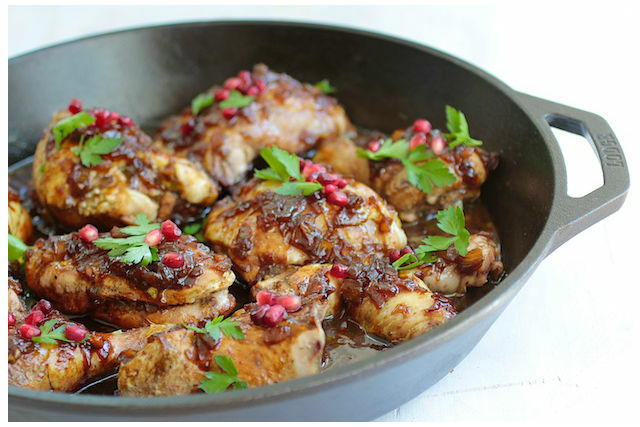 The chicken is cooked with beets and thickened with coarsely ground walnuts and pomegranate molasses. 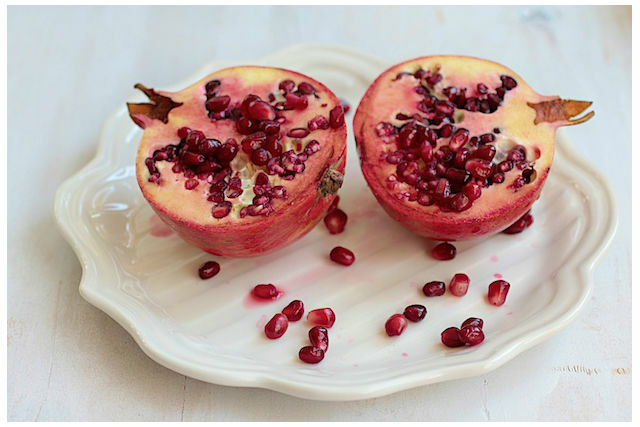 As in many Persian dishes, pomegranate seeds are used as a glistening, jewel-like garnish. She illustrates removing the seeds a few different ways but I like the “water method” best. Simply slice off the two ends and quarter the fruit with a knife. Submerge the quarters in a bowl of cold water and pull out the seeds with your fingers. The pith and skin float to the surface as the arils sink to the bottom. Scoop out everything but the seeds and pour water and seeds through a mesh colander to collect them. Holiday chicken is potent with pomegranates goodness as this symbolic fruit is used in 3 ways: juice, molasses and arils (seeds). 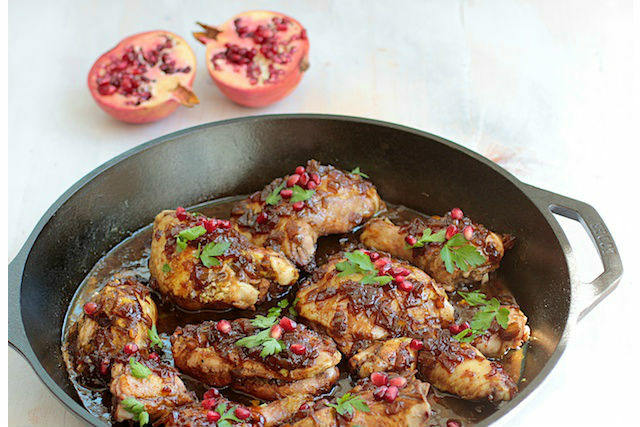 The flavors are bold, tangy and slightly sweet — a Middle Eastern influenced sweet and sour! Heat 2 Tbsp canola oil in a large pan (you’ll need a lid for later). Sauté chopped onion until soft and translucent. Add minced garlic and saute for 2-3 minutes (do not brown). Stir and bring to boil. Reduce to an active simmer, and cook uncovered, for about 20 minutes or until sauce is reduced by about ½ the volume and slightly thickened. Taste sauce and adjust seasoning. Too tart? Add 1-2 Tbsp honey. Want more kick? Crack more black pepper. Heat remaining 2 Tb. of oil in pan and place chicken parts skin side down. Brown on one side and flip to second side. Do not crowd chicken in the pan as this causes chicken to steam rather than brown. A cinch to make and fun to eat.